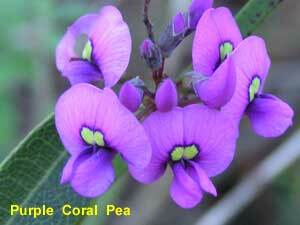 With over 1,100 species, the Pea Flower family is one of the largest in Australia. There are about 1,000 species of Orchids in Australia and as many as 35,000 species worldwide - making it the world's largest flower family. 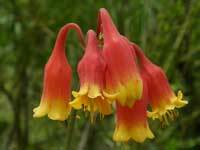 * Most of the Australian species in the Liliaceae Family have recently been reclassified into a dozen or so other botanical families. The Iris family is represented throughout the world by freesias, gladiolis and irises - and in Australia by the Genus Patersonia. The Eastern Water Dragon is one of sixteen kinds of snakes and lizards that live in the Park. Other lizards include the Southern Leaf-tailed Gecko and the Copper-tailed and Eastern Water Skinks. The Eastern Water Dragon to the right appears a little skinny - this is because it is early October, and she has only recently emerged from hibernation. 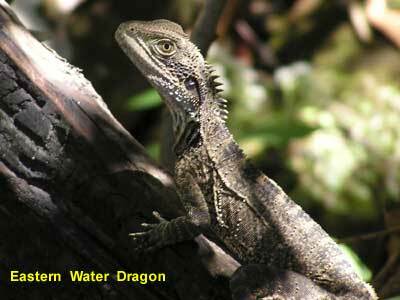 Eastern Water Dragons are found along the coastal watercourses of Eastern Australia. To escape a threat, they will plunge into the water. So if you hear a splash while walking near a creek in the Park, it may be an Eastern Water Dragon. two petals that are usually fused together and referred to as the keel. 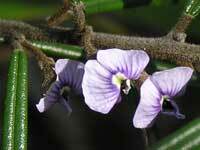 This pea flower is characterised by its sharp branches (spines), and heart shaped leaves. Flowers in spring. A virtually leafless plant with characteristic flat stems. Similar to B. ensata (see our Blue Mountains peaflowers, but B. scolopendria has reddish wings and the flowers are larger. 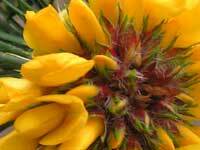 Flowering in Autumn, this, plus its variable leaves and crimson keel identify it. The leaves vary on the plant and may be ovate or thin, and also vary in size. Probably the most common peaflower in the Park, and although flowering in winter and spring, there are invariably "spot flowers" throughout the year. Its twisted perpendicular narrow leaves helps identify it. The leaves aren't hard. Dillwynias typically have broad standards, and keels that are shorter than the wings. 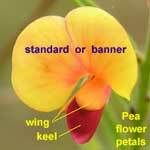 The Rough Parrot Pea (a name not in common use) is identified by its 15mm long rough leaves with the Dillwynian channel on top. 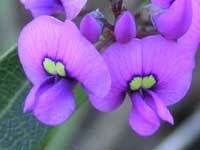 Flowering in late winter, this beautiful pea flower is also known as the Erect Hovea or Blue Bonnet. The latter being a delightful name. 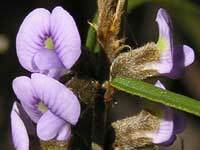 While the Common Hovea is a small shrub to 50cm in height, Rusty pods is a small tree and can be over 2 metres high. It also has longer, shinier and darker green leaves. 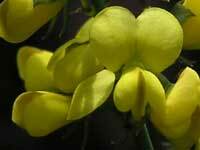 Distinguished from the Hoveas to the left by its wider leaf, it is also known as the Northern Hovea. A mass of deep yellow flowers in spring. 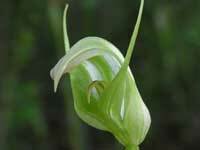 Its height (up to 4 metres) and flat pointed, occasionally concave, leaves identify it. 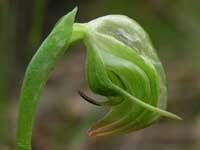 Identified by its green keel and hairy concave leaves. Similar to P. hispidula however P. villosa's leaves if not concolourous (of uniform colour) then the lower surface is darker than the upper surface - vice versa for P. hispidula. A beautiful rosette of flowers - about 30mm across. 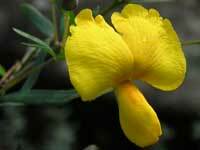 Its leaves are 30mm in length. Besides its size, it can also be identified by the crimson "keel" under each flower - see flower on the right. 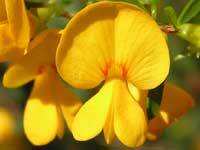 A 2 metre high shrub with a crown of golden pea flowers. Identified by its 1 cm long stipules (a small leafy growth at the base of a leaf) - see enlarged image. Spring flowers that are 30mm from top to bottom. Distinguished from similar Wedge Peas by the trifoliate broad flat leaves. 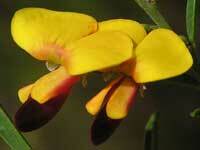 Also known as the Golden Glory Pea. 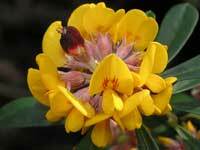 Its 10mm wide flowers have the most beautiful yellow colour. 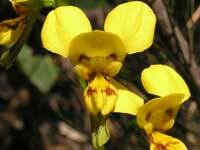 It is identified by its (usually 5) pinnate leaves and warty stems. Compared to the trifoliate leaves of G. minus. Similar to the Broad-leaf Wedge Pea (far left), but has narrower trifoliate leaves. 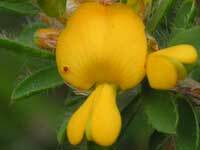 If anything, despite its name, its flowers are a titch smaller. 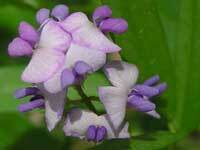 This widespread climber is found in all eastern states. Its narrow long leaves helps identify it. 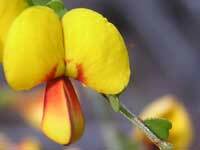 The opposite heart shaped veined leaves identifies this spring flowering pea flower. 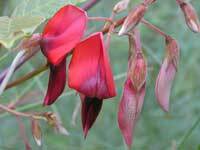 A robust climber that produces exquisite crimson pea flowers in spring. 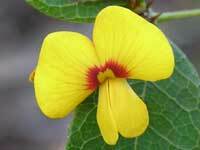 Phyllotas can be recognised by their long bracteoles - the leaf-like bract under the flower. Flowering in Spring, its broader bracteoles distinguishes it from the Summer flowering Phyllota grandiflora. Flowering in early spring, this magic climber has several cultivars - "Happy Wanderer" being one. Also known as the False Sarsparilla. Differentiated from S. vimineum by its shorter wings that expose its keel, and having only a hint of red on some flowers, and none on most. The flowers are barely 5mm wide and long. 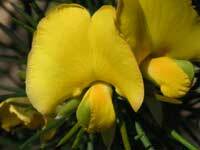 It is also known as Native Broom - and this describes it well. 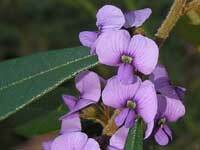 This leggy leafless shrub grows to several metres, and is spring flowering. It is the only species in the Viminaria genus. 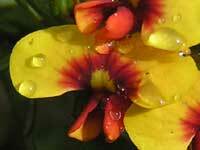 Although Orchids vary greatly in form, colour and size, their flowers are composed of 6 segments. The outer 3 segments are the sepals; and inner three segments are the petals. The third petal becoming a lip or labellum. 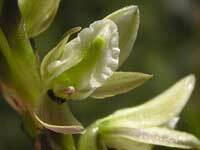 Donkey Orchids are easily recognised by their donkey ear-like petals with two leg-like sepals below. 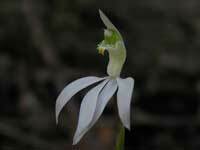 This spring flowering Donkey Orchid is 30mm from the top of its petals to the bottom of its sepals. 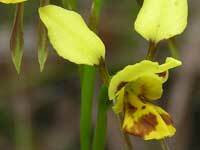 A key in its identification is the lack of a callus on its labellum. Resembling a duck in flight, this small orchid's labellum snaps shut against the column trapping the visiting insect and turning it into a pollinator - see the full image. 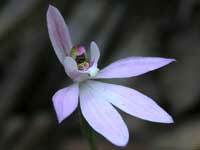 Also known as the Piano Orchid, this orchid occurs in all other Australian States except the North Territory. It can be identified by its long leaf stem. 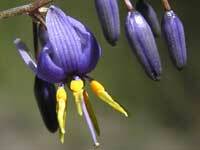 Also known as the Blue Sun Orchid, it has dark blue dots on its upper three segments. The flower is 25mm wide, but needs a sunny day to open. 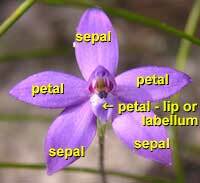 It is best identified by the finger like papillae as not all Spotted Sun Orchids have spots as this image shows. 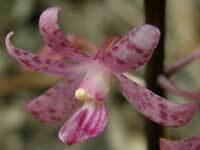 A small orchid that is 20mm wide. 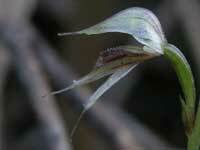 The flower stem is leafless - the leaf leaving the stem near the ground. Summer flowering, its green stem and dotted ovary* differentiates it from the other Hyacinth Orchids found in the Sydney Region - D. punctatum and D. roseum. 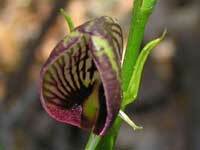 Identified by its purple stem, curled back segment tips and lines on its labellum. The orchid is 30mm across. A tiny orchid well hidden by is mute colours and shady locations. Also known as Pixie Caps, its basal leaf helps locate and identify it. 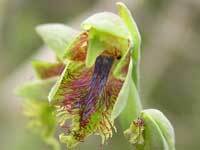 Flowering in winter, this translucent green orchid stays "drooped". 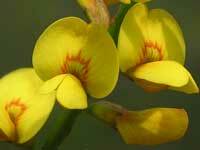 The flower is 20mm long. Characterised by its long leaves and the multiple flowers on each stem. 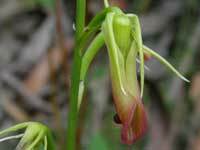 Also known as the Pointed Greenhood after its pointed labellum. 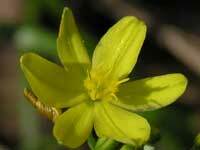 It flowers in Autumn with a single flower at the end of each stem - the stem has a rosette of leaves at its base. 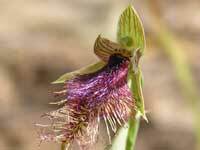 Spring flowering, its thick purple beard at the top of the labellum differentiates it from the other Beard Orchids. 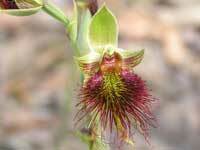 Spring flowering, the Copper Beard Orchid is identified by the two blue plates on its labellum. 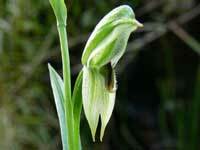 The lack of "eye-like" glands at the base of the labellum distinguishes this Beard Orchid from its siblings. 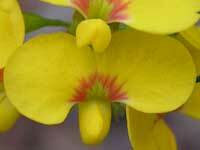 C. carnea's labellum lobe doesn't protrude, its labellum tip is yellow and it tends to be pinker. C. fuscata's labellum lobe protrudes and its labellum tip is white, and it is smaller. C. catenata's labellum is far more vertical before it slopes forward. 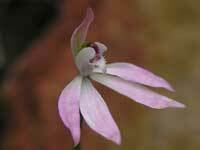 A small orchid that is 20-30mm across whose colour varies from near white to dark pink. Here is an image showing its distinguishing characteristics. 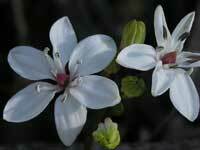 Flowering in early Spring, Dusky Fingers' sepals and petals are less than 7mm long. 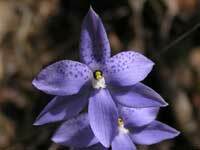 This attractive orchid is 25mm wide and flowers in winter and early spring. 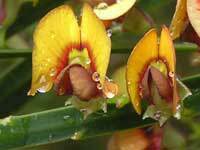 There are 5 species of the Cryptostylis genus in Australia - two of which can be found in the Park. 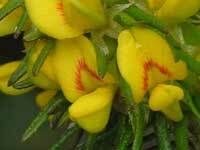 They can be identified when not in flower by a single leaf protruding from the ground. 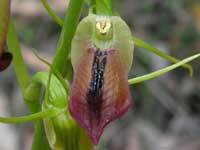 A distinctive orchid identified by its drooping crimson tipped curled tongue-like labellum. 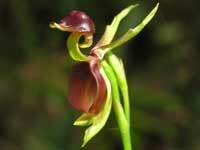 The labellum, which is 25mm in length, has a dark red bump on its lower back. This is the reverse side of the flower. This orchid is all labellum. The other petals and the sepals looking more like leaves. 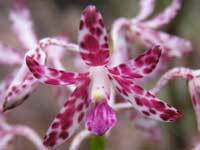 It is also known as the Bonnet Orchid and the Tartan Tongue Orchid. Most of the Australian species in the Liliaceae Family have recently been reclassified into a dozen or so other botanical families. Their new family is included in the their description. 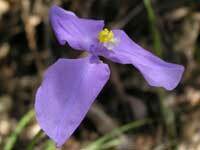 The most common Blue Flax Lily in the Park, distinguished from Dianella caerulea var. caerulea by its leaves and flower coming from along the stem. 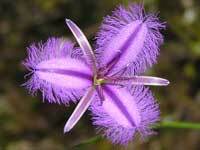 With a 15mm wingspan, the spring flowering lily has a sweet fragrance. A truly beautiful lily. Flowers in late spring and summer. 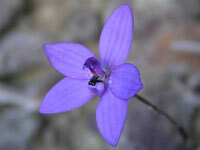 The flower is about 4cm long. that is around 4cm in length. A delightful spring flowering lily that's 15-20mm wide. 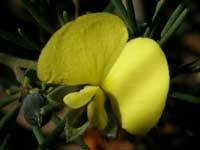 The twisted flower after flowering readily identifies it. Another lily that is stunning in close-up. 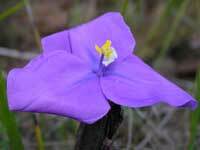 The distinctive lily-type flower is about 12mm wide and bears three fine purple stripes on each petal. 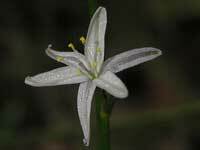 This species of the easily recognised fringe lily is identified by its lack of basal leaves and the striate stems. It is about 25mm across and only lasts a day. Also known as the Branching Fringe Lily. Also see our Native Irises web page. Flowering for barely a day, the 50mm flowers of the Purple Flags can be from light blue to dark purple. The leaves of the Silky Purple Flag are fan like and come from the ground; while the Leafy Purple Flag's leaves and flower stork are borne on a stem.